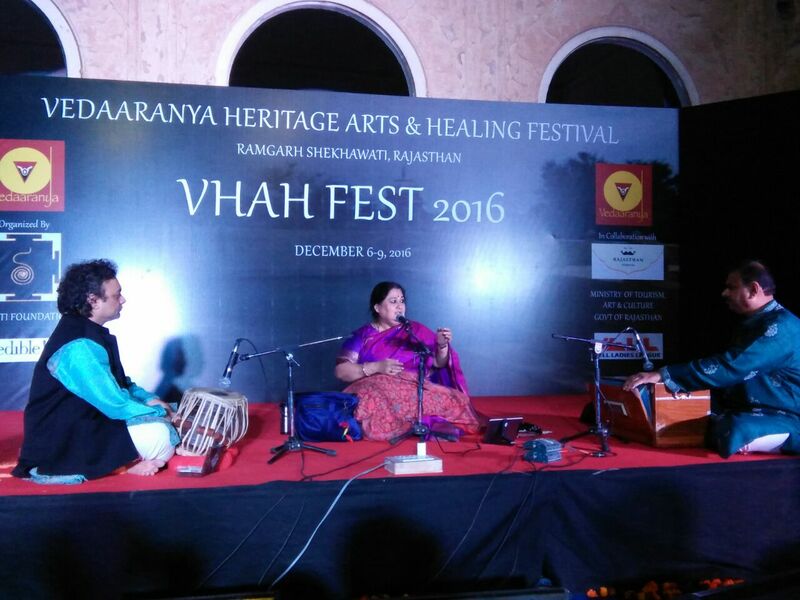 Jaipur, 9 December: The four-day Vedaaranya Heritage Arts and Healing Festival’ (VHAH) concluded with a bonanza of events today. The festival was organized by Department of Tourism (DOT), Government of Rajasthan and Shruti Foundation in collaboration with All Ladies League at Ramgarh Shekhawati in Sikar district, near Churu. Day-four commenced with ‘Ramgarh Shekhawati Heritage walk’ for school students followed by Tabla master class by eminent artiste, Shri. Tansen Shrivastava. The Chief Guest on the valedictory session was Principal Secretary, Local Self Governance, Dr. Manjit Singh who gave away the certificates to the participants. The Guest of Honour was SDM, Fatehpur, Shri Pushkar Dutt. The closing ceremony witnessed ‘enchanting’ by Shruti Poddar and students from school and colleges. The vote of thanks was delivered by Trustee, Shruti Foundation, Smt. Priya Hingorani. On Thurday, eminent singer Smt. Shubha Mudgal performed on semi classical and classical music which was followed by an enthralling theatrical performance — ‘Natya Katha: Krishna’ by Padma Vibhushan, Dr. Sonal Mansingh. It is to be recalled the four-day VHAH Festival Mela witnessed a plethora of events like interactive sessions, workshops on heritage wellness and healing arts, heritage restoration and master classes and cultural performances. A number of stalls on Shekhawati furniture, blue pottery, traditional dresses and herbal medicines and heritage cuisine and artefacts were put up on display for the tourists and visitors.